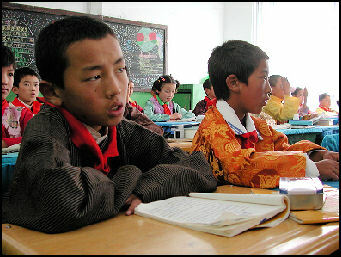 Tibetan kids in a Chinese-run school Tibetans complain that they are second-class citizens in their own country. They complain about the mass migrations of Han Chinese into Tibet and the fact that the Chinese get all the best jobs, forcing their unemployed children to turn to crime to survive. Even jobs for tour guides require fluency in Chinese and tend to focus more on Chinese history than Tibetan history. The Tibetans are also annoyed that Chinese eat dogs (animals believed to be the last reincarnation before humans in Tibetan Buddhism); they don't walk clockwise around temples and monasteries; and they smoke everywhere and toss away their cigarettes at wooden temples and "even under the holy trees." Communist officials and workers are often rude to Tibetans and more polite to Chinese. Tibetans claim the Chinese legal system and law enforcement discriminates against them. They inevitably lose legal disputes involving Chinese. The New York Times described one man who whose house was burned down for no apparent reason. When he tried to seek help, the authorities said, "What race are you? Tibetan? Go ask the Dalai Lama for help." Tibetans are often the victims of Chinese corruption. In recent years, for example, Tibetans have found it easier to obtain passports but they are required to fork over $300 in bribes in addition to the $30 passport fee. Chinese also complain of poor treatment. One Chinese man told the Los Angeles Times, "The Tibetans say to us, 'This land is ours---get out. What am I supposed to say that?" Most Tibetans can't speak very good Chinese and most Chinese can't speak Tibetan. The two groups often view each other with disdain and suspicion and define the other with stereotypes and prejudice. Many Chinese consider Tibetans to be uncivilized, superstitious, hostile, lazy, ignorant, dirty, unpredictable and a bit savage, and regard the Tibetan religion as examples of "false consciousness" and "incorrect thinking." Most Tibetans view the Chinese as greedy, moneygrubbing, manipulative, arrogant, unwanted house guests. One nationalist Tibetan told the Los Angeles Times, "We believe in Buddhism, they're atheists. They think only of making money." Tibetans are particularly suspicious of Sichuanese, whose women are regarded as loose and who men are thought of as tricky and sly. The Chinese have a reputation for being more industrious than the Tibetans. A successful Tibetan businessman told the Washington Post, "The Tibetan people and the Han Chinese people are very different. The Han Chinese are very clever, they think more broadly than the Tibetans. Tibetan people are easily satisfied; the Chinese are never satisfied." "Even Tibetans like to hire the Chinese because they have more modern methods and they work harder," one Tibetan man in Lhasa told the Washington Post. "Tibetans would rather give their money to a beggar or to a monastery in hopes of earning merit for next life than put it in the bank or invest it,” he said. To illustrate the difference between traditional nomadic Tibetan thinking and Chinese thinking, a western analyst told the Washington Post, "If you got eight yaks what's the next best thing. The nomads would say, 'Nine yaks.' The Chinese would say, "No, sell a yak, then you get money. With money, you can build a house." "The Dalai Lama group and some Westerners see Tibet's peaceful liberation and development through a tinted glass," Du Yongbin, a scholar at the China-Tibetology Research Centre in Beijing, said in a commentary in the China Daily. "They either ignore the unprecedented development that Tibet has experienced or think Tibet's development threatens traditional Tibetan culture. Their logic seems to be to treat Tibet like a museum piece," he said. "Lamaism", a jingoist and patronizing account of Tibet and Tibetans written by Briton Austin Waddell, who played a major role in the British invasion of Tibet in 1904, is still used as an authoritative source in China. Serf, a 1963 Chinese government film depicting the misery of feudalism, was widely seen on the mainland. "Tibet has always been part of China, at least since the Ming and Qing dynasties," one China traveler to Tibet told the South China Morning Post: "Before liberation, Tibetans were all serfs, and then the Communist Party liberated them so they could be their own masters. In the old days, they had horrific practices like skinning people alive." Says Sautman: "Many younger Han people do romanticise Tibet, chiefly as a place of exceptional spirituality, in contrast to most of the rest of China. But this age cohort is, of course, huge, so there are still many younger Han who think of Tibet as still relatively backward and, after the racial killings in Lhasa in 2008, as harbouring some people very hostile to Han generally." "Even Han who romanticise Tibet deplore the murders of 2008, but are perhaps more understanding of the demonstrations that took place." Sperling suggests: "Even though interest in Tibet within China is still a minority taste, it may well happen that an interest in a romanticised Tibet will lead a few who hold that interest to confront very real Tibetan discontents." "There is an estrangement between Tibetans and us Han Chinese, but I'm not afraid," says Ran. "There are lots of police around." Since the troubles of 2008, People's Liberation Army and People's Armed Police camps have been positioned next to or close to monasteries in many towns across Kandze (two among the recent spate of self-immolations took place in the county). Over the summer, the sound of monks praying was frequently drowned out by the sharp bark of military orders and the crunch of soldiers marching. Dawa has also argued that Tibetans never had a sense of statehood, which is why many did not oppose the PLA invasion. It has only since their culture has come under threat that have started to speak out. Throughout history, Tibetans were not a unified people and the concept of a sovereign state in the modern sense never existed in the minds of Tibetans before the People's Liberation Army invaded Tibet in the 1950s, he said. “The reason why most Tibetan civilians did not resist when the Chinese army entered Tibet in 1951 was because the concept that 'our country is being invaded,' did not exist for them,” Dawa said. “However, Tibetans rose against Chinese rule in 1959 because the Chinese were touching on something that Tibetans felt closely attached to,” he said. Some Chinese argue that the Chinese have more of claim on Tibet than Americans have on much of the United States. China and Tibet have a relationship that goes back centuries which is more than Americans can say about their relationship with native Americans. In the 1940s, native Alaskans made up more than half of the population of Alaska. Now they make up about 15 percent as a result of migration of people from the people from the lower 48 states. Does that mean that the United States practices "cultural genocide." In China’s defense, over the last 20 years China has jailed several hundred people in Tibet while other nations have committed worse atrocities against minorities on their soil. In Cheychna, the Russian army killed about 75,000 civilians and destroyed its capital. Some of the Chinese that have come to Tibet have come with a frontier spirit comparable to that of Americans heading West in the 19th century. Some are escaping the law in their home provinces. The Washington Post talked with one man who came to Tibet from Gansu Province after stabbing a man in a drunken brawl. Critics charge Chinese with conspiring to gain control of Tibet by outnumbering the Tibetans, a policy that served the Han Chinese well throughout its history of conquest. The Dalai Lama says that the massive "population transfer" of migrating Chinese to Tibet is one of his primary concerns. He has called China’s immigration policy “demographic aggression” and an element of China's "cultural genocide" in Tibet. Some argue that Beijing if unfairly blamed for the influx of immigrants. In many ways the government has little control over the situation unless it wants to close the borders into Tibet and if they did that Western human rights groups would make a fuss. The migration policy has changed over the years. Until fairly recently few Chinese had any interests in going to Tibet. In the 1960s and 70s, ordinary Chinese were banned from moving there. In the 1980s, Beijing dispatched work teams to Tibet to build roads and other infrastructure projects and work in mines. The Hong Kong-based South China Post reported in 1996 that a half million Chinese laborers had been brought the Tibetan plateau to work in copper mines. The World Bank had planned to provide a $160 million antipoverty loan to resettle 58,000 Chinese farmers on traditional Tibetan lands. The plan was scuttled due to efforts by the Tibetan lobby in Washington, U.S. Senator Jessie Helmes and the rap group, the Beastie Boys. Beijing then went ahead with a similar project, beginning with settlement of 20,000 Han and Hui Chinese in the traditionally Tibetan Dulam region of Qinghai Province. No one is sure how many Han Chinese are now living in Tibet, but the number is increasing all the time. Beijing says that Han Chinese make up 3 percent of the population of Tibet Autonomous region while Tibetan exiles say the figure is around 50 percent. The Beijing figures do not include the hundreds of thousands of migrants who have come to Tibet and failed to register. Nor does it include soldiers, minors or road crew workers. Most Chinese have flocked to the cities and large towns to make money and could care less about politics. They work as taxi drivers, own souvenir shops, run vegetable stands in the markets, dominate guide operations at major monasteries, work in government offices, and operate Chinese restaurants, Tibetan restaurants and karaoke bars decorated with prayer flags. Outside the cities there are few Chinese. Those that work there are truck drivers, miners and construction workers building roads and railroads. Between the early 2000s and the mid 2000s Lhasa has gone from being a largely traditional Tibetan city of 250,000 to a modern Chinese city of 500,000, with more than half the population now Chinese. Many Chinese live in neighborhoods that are separate from the Tibetan neighborhoods. The number of brothels and karaoke bars has increased greatly since the Chinese began arriving in large numbers. Chinese vendors sometimes sell dog meat on the streets (killing dogs is an abhorant idea to Tibetans) and dominate the booths selling prayer scarves at the gates of Jokhang temple. In the early 2000s many of the Chinese that lived in Lhasa left during the winter. They got terribly homesick, didn't like Tibet and had a problem with the climate---the cold, the dry air, the altitude. They usually left Tibet for good after two or three years. Many Chinese believe that spending time at altitude seriously damages the lungs, enlarges the heart and shortens a person's life. Now many Chinese in Lhasa stay year round. Even so few have bothered to learn anything more than the most basic Tibetan language. Entire neighborhoods of traditional Tibetan buildings have been replaced by hastily-built office buildings and shops with signs in Chinese rather than Tibetan. Young Tibetans mix Chinese words with Tibetan words. Well-to-do Tibetans send their children to schools in Beijing and Shanghai.